Today’s post is a card made using the left over embellishments from the Picnic Paradise My Paper Pumpkin kit. It is so fun to stretch the My Paper Pumpkin kits by coming up with alternative designs. With every my paper pumpkin it, Stampin Up is very generous with the contents and there is always stuff left over and I try and use the extras to usually make more cards. In case you did not see the post for the intended use of the September Boo-tiful Bags My Paper Pumpkin you can see it here. When I was done I had plenty of left overs and made the 4 cards here by just using cardstock and burlap ribbon from my stash. Super simple but fun never the less. If you are wondering what My Paper Pumpkin kits are visit the paper pumpkin website to check it out and contact me if you want to subscribe or purchase a pre-paid subscription. Once you are signed up you will get your own paper pumpkin kit complete with all the ink, stamps, pre-cut and measured paper and embellishments to create your sweet projects. Once you subscribe, you will anxiously await for your paper pumpkin kit to show up in your mailbox each month. Happy Halloween one and all. Since it is Halloween it is time to bring on the Boos. First up is Cammie’s very creative rendition. She used various sizes of circle punches and even the bird wing punch to make eyes of all shapes and sizes. She even added the fun googly eyes. The sentiment “Bring on the” is partially stamped from the Making Spirits Bright #135089 stamp set in the Stampin Up holiday catalog. 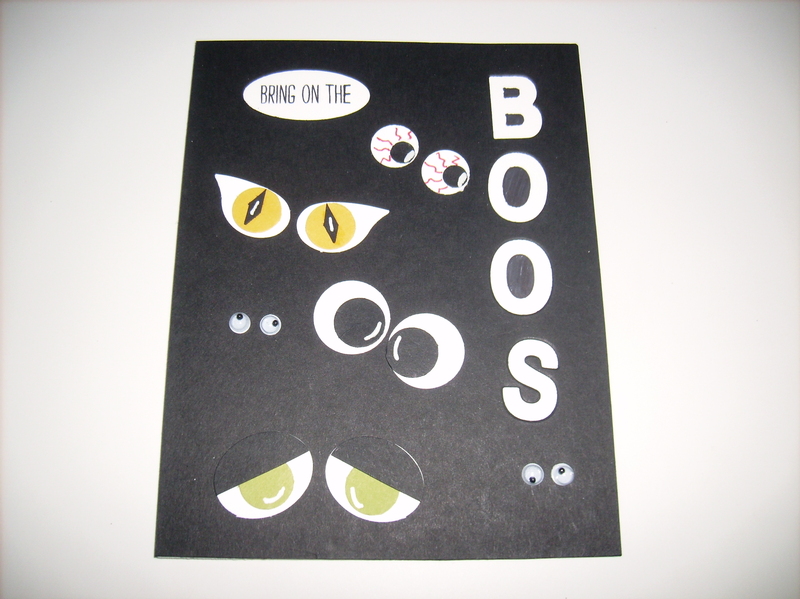 The BOOS is cut using the Little Letter Framelits #133730. I was so inspired buy Cammie’s card coupled with the fact that I bought the Making spirits bright stamp set specifically for the Bring on the Boos image and did not get around to using it until last minute when I decided to make my Bring on the Boos card. 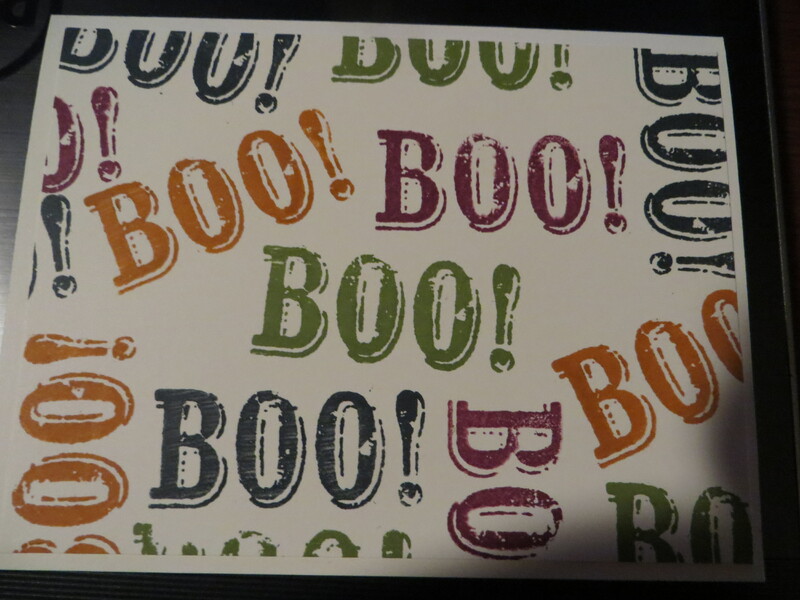 However, for my card I randomly stamped the BOO! 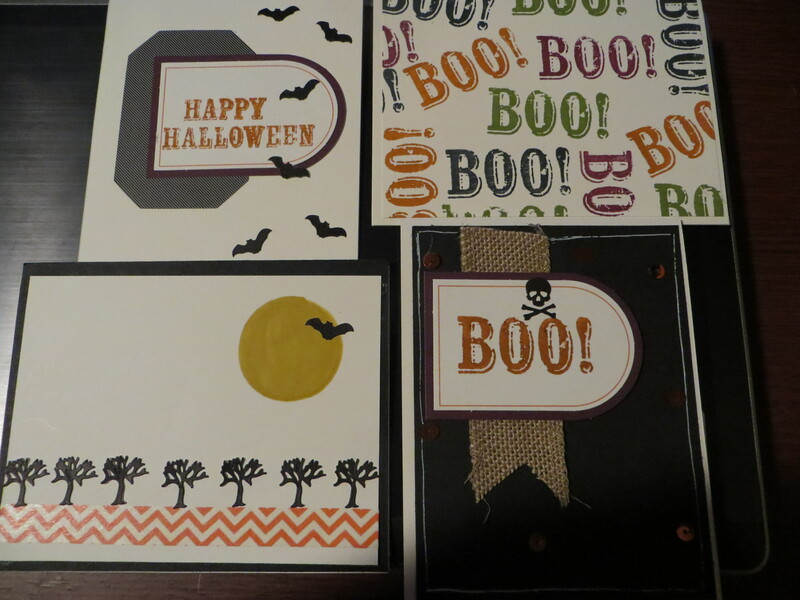 image in 3 colors of ink from my Sept Boo-tiful My paper pumpkin kit. For the inside of the card I stamped the Bring on the Boos image from the Making Spirits Bright holiday set. 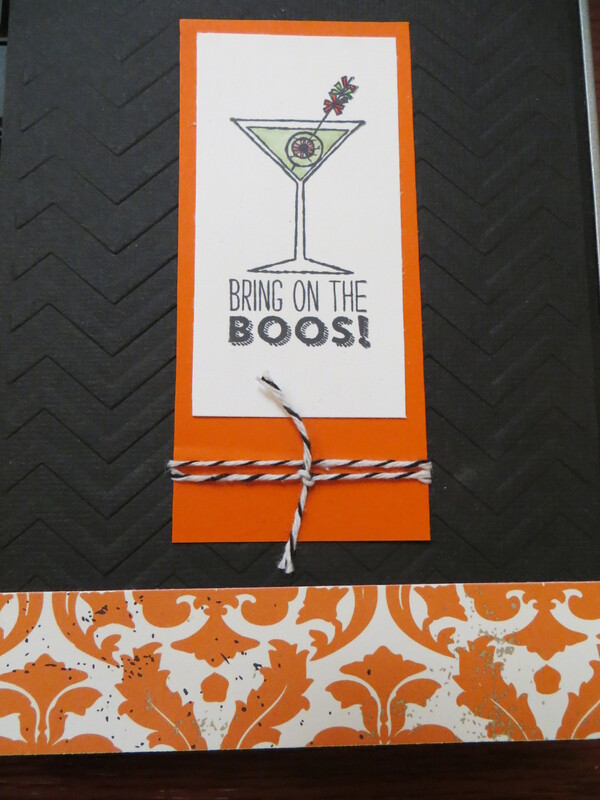 Finally, I am posting a Bring on the Boos card that I received from a customer, Elizabeth Mara. She used the Halloween image from the Making Spirits bright stamp set and lightly colored in the booze in the glass and matted it on orange cardstock and tied with a sweet bow of bakers twine and then added it to the black chevron#127749texture embossed background layer. So there you have it! 3 ways to bring on the Boos!